Zevitas Marcus is pleased to present Home Work, an exhibition of recent paintings by artists Sarah McEneaney and Ann Toebbe. The exhibition will run from November 4 to December 23, 2017 with an opening reception Saturday, November 4th, 2017 from 5:00 – 8:00 PM. Home Work brings together the work of two artists who are separated by a generation, yet share common interests in subject matter and certain stylistic impulses. Both Toebbe and McEneaney cull from intimate lived experience when it comes to the subjects they choose to address. And both, in some sense, favor a pictorial language that can be loosely defined as “faux-naive.” That is to say that they both actively draw from the traditions of self-taught and outsider art, even though they each undertook academic training. Their way of making images is a conscious choice and a conceptual gambit. ‘Home’ and ‘Work’ are, for most people, the two most important and familiar zones in their lives. Toebbe and McEneaney confront these spaces with a familiarity that can emerge only after years of acquaintance. 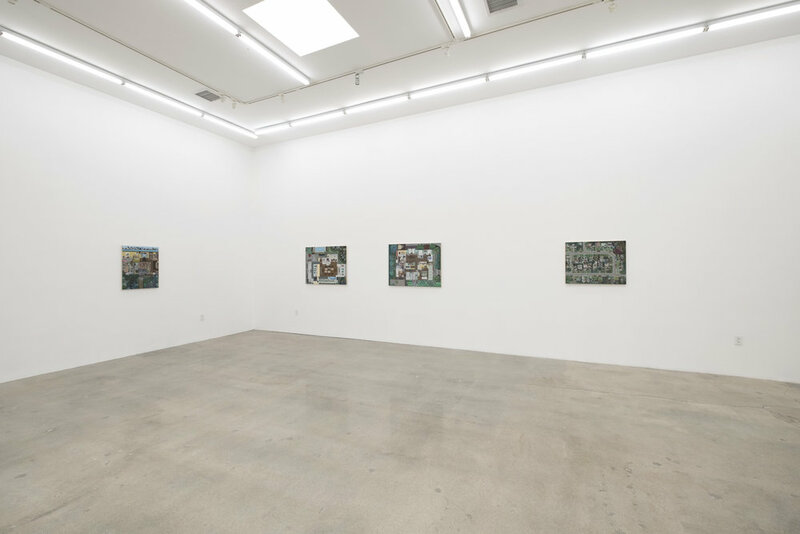 Their paintings invite the viewer into typically private locations that are presented without any sense of inherent hierarchy. Both artists offer us spaces that are flattened, overflowing with visual information and superficially candid. The situations encapsulated in their paintings are carefully selected, edited, and rendered. 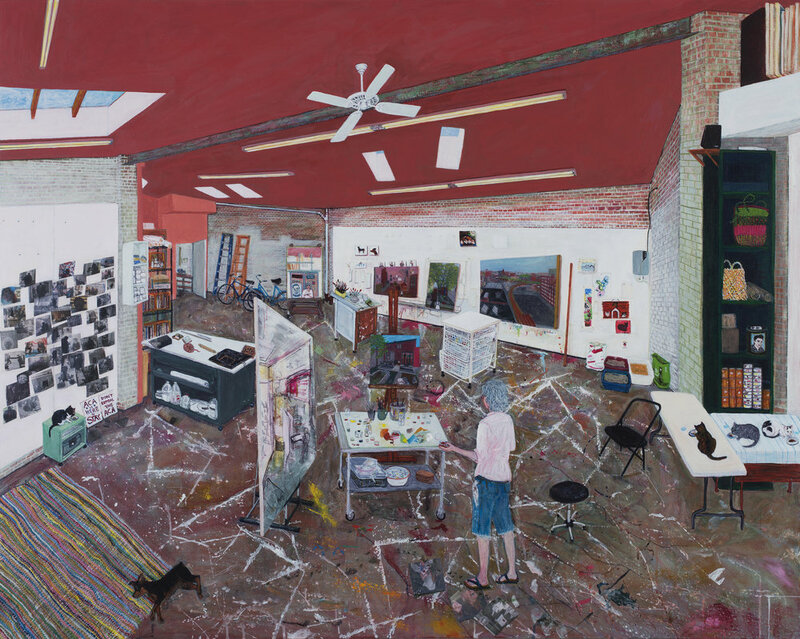 In one sense, Toebbe and McEneaney make observational paintings, yet they are less about reportage than they are about the psychic effect that Home and Work both exert. Sarah McEneaney’s paintings are autobiographical narratives that arrive from drawings, memory, observation, imagination, and photographs. 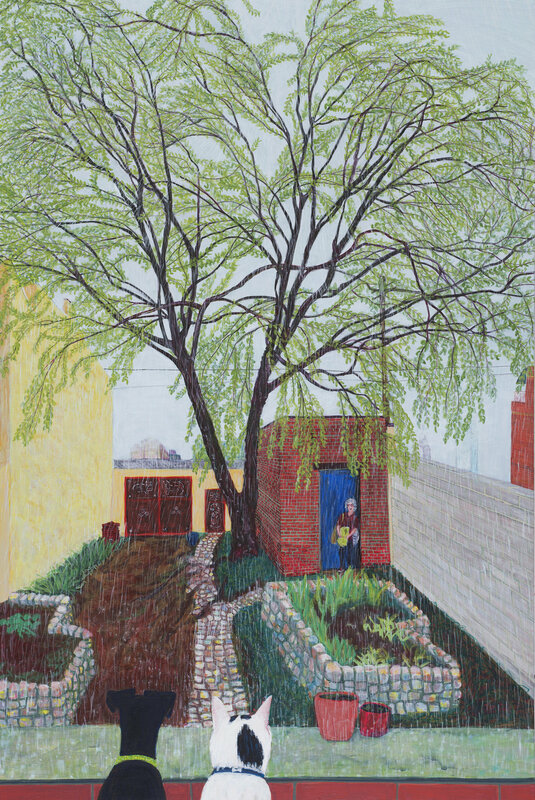 As she has stated: “Though very direct, even factual, the paintings read less as memoir and more like creative non-fiction.” McEneaney most often addresses the spaces where she lives and paints, and conjures an intuitive pictorial space where her scenes can seemingly be comprehended at a glance. In her paintings, walls and furniture take on their own dimensionality, melding into one another, and the viewer is provided with an extraordinary amount of detail. 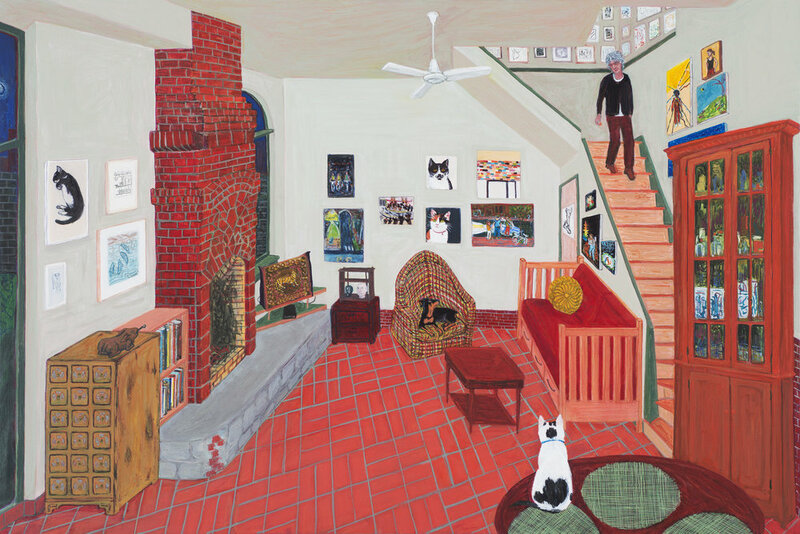 All of the paintings presented in Home Work include the artist, who can be spotted within the frame, tucked into a corner or walking through a door, with her animals serving as constant companions. Ann Toebbe’s paintings present aerial views of places from her personal history. 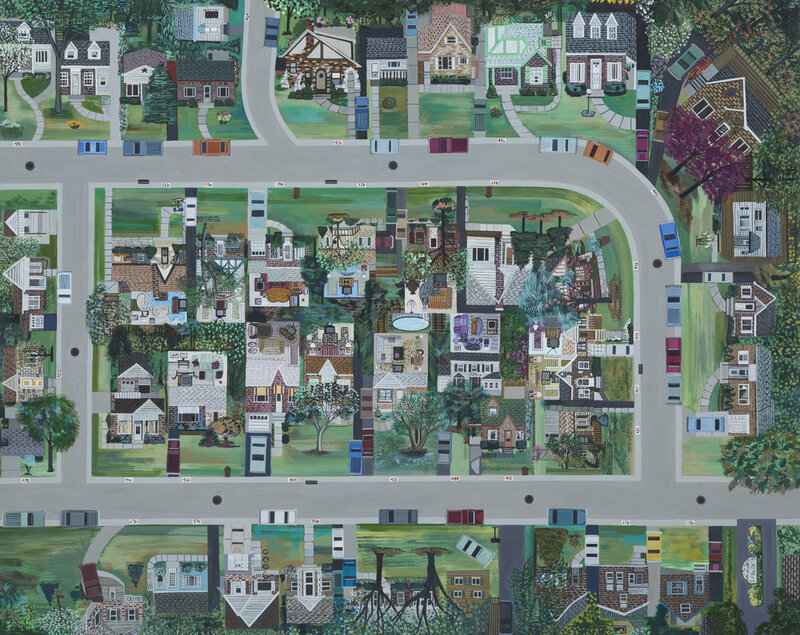 The homes she depicts, or in one case an entire neighborhood, are visually deconstructed, unfolded and flattened. Once thus processed, they are capable of being studied, flipped upside down, and studied again. Miniscule clues to daily life provoke further investigation. Toebbe’s paintings are narrative. Relationships are explored – parents versus in-laws; sister versus self – although figures are absent. 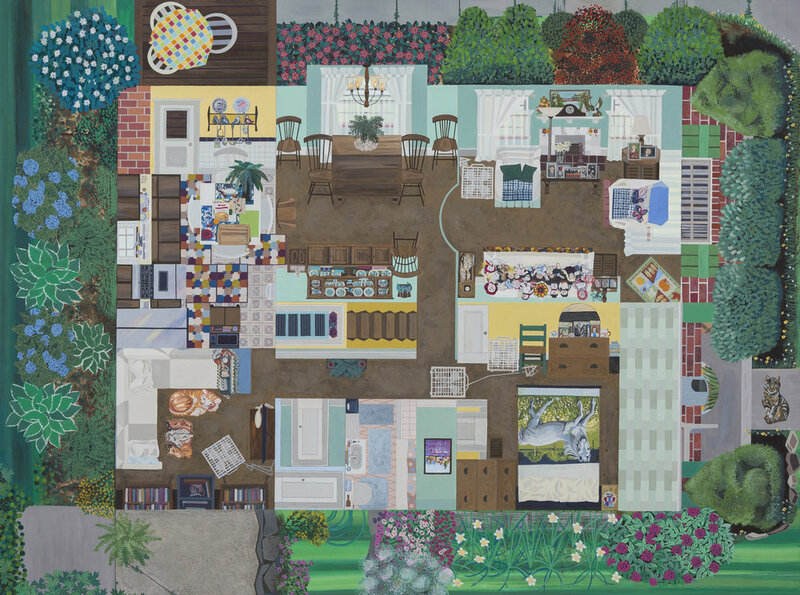 The sparse rectitude of one family’s home is contrasted with an abundance of knick-knacks in another; colorful walls cluttered with artwork are measured against scenes of carefully staged family photos. When seen as a group, it quickly becomes apparent that Toebbe’s primary interest is in how space and memory form identity.